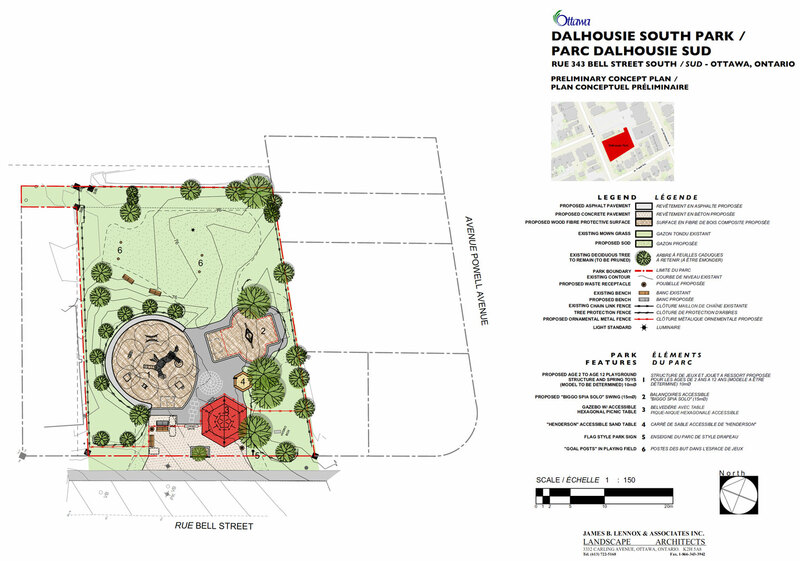 The public consultation process for the Renewal of Dalhousie South Park at 343 Bell St South in the Glebe Annex has recently come to a close. After the plans were briefly unveiled at the Community Association’s AGM in November, residents were again presented with the concept drawings in January, and were asked to provide input. Given that the concept itself was based on years of community input, the feedback the city received was relatively positive, according to Jeannette Krabicka, the park planner overseeing the renewal. The park, which was slated for renewal in 2017 through the City’s Asset Management Branch, is also benefitting from a contribution from councillor David Chernushenko as part of the ward’s cash-in-lieu of parkland fund. This injection of funds allowed the design to include more than just a replacement of current play equipment, but allowed for some play structures to be added, and the gazebo to be moved, increasing the functionality of the tiny urban park. Residents will note that the popular play area at the back of the park, often used for kicking around soccer balls, will remain free and open. Those impromptu soccer games will be aided by a set of informal goal posts to give players something to aim for. While the back remains open, the play area at the front of the park will be optimized with more play structures that better fit a wide range of ages. Moving the gazebo from the centre of the park to the periphery also allows for more space to be devoted to play structures as well as providing a sheltered spot, close to but slightly away from the play area, for people of all ages to gather, picnic and socialize. Although safety regulations didn’t allow a traditional swing set to be installed in the small space available, moving the gazebo made space for a saucer swing set that can be enjoyed by children of many ages. This was an exciting addition, as year after year, a swing set was the most widely requested play structure by Glebe Annex residents. If all goes well, residents can expect that the renewal/improvement to happen this summer. The park may be out of commission for several months, but it’s all for a good cause, as it will be the first time in 25 years that the well-used space will receive such a major overhaul. Thank-you to all who contributed their time, ideas and hopes for the renewal of our park. We will be sure to keep you informed of its progress.